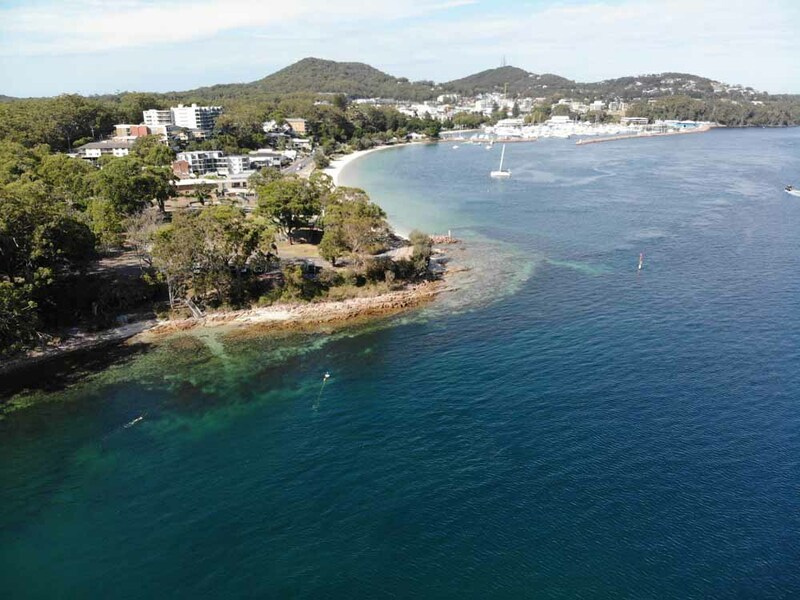 Michael McFadyen's Scuba Diving - Fly Point to The Pipeline One of the great advantages about a dive trip to Port Stephens is that if the weather is extremely bad, there are three excellent dive sites that can be dived in virtually any conditions. One of these dives is the Fly Point to The Pipeline Drift dive. Of course, you should not restrict yourself to diving these sites in poor weather. A good plan for a dive weekend here is to do a couple of boat dives on either Saturday or Sunday morning and a single on the other morning. Then, do a shore dive as the other dive and even a Saturday night dive as well. This drift dive is from the Fly Point reserve to the old (and it is old) pipeline pipe that is located past the fishing co-op building which is found past the main marina. It can only be done on an incoming tide and preferably nearer the high tide although you can do it any time on the incoming tide. A point to note, although this spot is also known as The Sewage Pipe, I do not think that the pipe was ever a sewage pipe. Anyhow, it does not work now so there is no danger to divers. Fly Point is located almost opposite the marina and is reached by going past the roundabout, along the beach front to the small park as the main road turns to the right. There is a small car park here where you can gear up. The car park can get busy and it is worth getting there early. For the drift dive, it is best to start the dive about one hour before high tide. This still enables you enough time to be a bit late and will ensure that you get along at a good rate and make it to the exit location. You will need to take one or more cars to the parking area at the co-op so that you can get back to Fly Point to get the other cars. It is too far to walk. Fly Point - dive starts at stairs middle left. The Pipeline is at the far end of the breakwater top right. There is a set of stairs at Fly Point that leads down from the car park to the water's edge where there is a path cleared of rocks into the water. Swim out towards the port channel marker before descending. If the current is too strong, you may need to descend early so make sure that you are close together or you will get lost. The tide can be very strong, I have completed the approximately 1.2 kilometres in 30 minutes, a speed of 2.4 kph or almost 1.8 knots. At the start the depth is 15 metres or so, a bit shallower in closer. There are some great bream, flathead and leatherjackets at the start of the dive. As you proceed, the depth increases marginally, only a metre or so. One of the main attractions of this dive are the soft corals. They are very colourful and plentiful. As well, there are heaps of sea pens of all colours. The fishlife here is not as prolific as doing a dive wholly at Fly Point or Halifax Park, but it is nice anyway. You may see small wobbegongs and Port Jackson sharks as well as large flathead and whiting. As you go, it is difficult to keep with your buddy and I would recommend that at the most, you go in twos or threes. Four or more divers would almost be impossible to keep together. The sand bottom comes up a metre, down a metre, up a half metre, down a metre, up a metre, down a half metre and so on. Along the way there are huge quantities of rope on the sea floor. The rope is stretched out on the bottom (whatever for, there is so much of it and sometimes running parallel to each other). This provides a great handhold if you want to stop to look at something or to wait for your buddy. There are other coils of rope all over the place. The dive takes you under the main entrance to the marina so it is certainly important that you never, ever, surface if you lose your buddy. Despite what you may have been taught in your course, it is far safer to complete the dive by yourself than risk being run down by a cruiser or speedboat. When you have been in the water for 15 minutes or so, start swimming towards the shore (that is, at 45 degrees to your left) and eventually you will reach the shallower waters near the breakwater. If you do this earlier (say 11 to 12 minutes), you will end up in the marina mouth. It will be about 22 to 24 minutes from the start. If the tide starts flowing from the opposite direction and the water gets dirtier and the depth stays at about five metres, then you have probably turned too early and are going to come up in the marina or thereabouts. Be careful!! If you turn at the right time, you should eventually see a plastic pipe running at right angles to the current (this is not the Sewage Pipe). This is an excellent spot to end the dive. If you find the Sewage Pipe, make sure that you exit as soon as possible as otherwise you will have a difficult job getting back to the co-op area.